Hay Bro Sis....As the Ducati Diavel motorcycle is a real muscle-bike unique look and performance, but with the disadvantage of high price for what it offers benefits over other sports models. Now Ducati gives a breath of fresh air to the range with the arrival of the Ducati XDiavel a custom variant to increase their cruiser character. It also introduces the technology of variable valve timing and thus can compare better with custom models. It was seen in the 2015 EICMA most striking novelty of Ducati and was the most beautiful motorcycle of the room. Its price will start from 20,290 euros in Spain, 1,600 more than the standard Diavel. There are several details that stand out in the new XDiavel, as its new driving position with more advanced controls, the wide handlebars, a seat only 755 mm of soil, long wheelbase up to 1,615 mm, rear tire 240mm width, steeper fork …Besides the custom spirit it is reflected in the 60 different driving positions that can be achieved with the three types of handlebars available, four positions of the footrests and five seats. Custom, but with variable valve timing. The Ducati XDiavel wins as the new DVT 1262 Testastretta engine with variable valve timing standard, 156 hp and 130 Nm of torque at 5,000 rpm expected. It has over 100 Nm of torque from just 2,100 mm. The new engine character is combined with the belt, unpublished Ducati, allowing smoother acceleration and less costly maintenance. This new transmission is complemented by the Ducati Power Launch (DPL), which optimizes traction control to fly from the traffic lights. The average consumption of XDiavel bike is 5.3 liters per 100 km. Painted in brilliant black deposit (Thrilling Black) with a matte black band and a red stripe in the middle. Elements painted in black with some aluminum trim motor. DLC treatment for the forks. Finishes for tops mechanized distribution, chassis plates, the footrests and the wheels exclusive design. Mirrors machined from a single solid piece. Enough look to justify the premium. 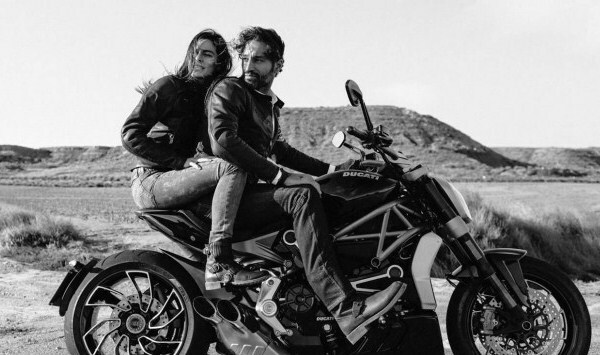 As good spin custom accounting, Ducati offers customers an official line of accessories to customize the XDiavel, commissioned from Roland Sands in California. Hence the various seats and special touches such as titanium exhaust out. The Italian firm also prepares its own line of clothing that fits perfectly with the nature of the new model.